The development of highly sensitive and selective enantiomeric platforms towards the rapid screening of active pharmaceutical ingredients (APIs) is nowadays a crucial challenge in several fields related to pharmacology, biomedicine, biotechnology and (bio)sensors. 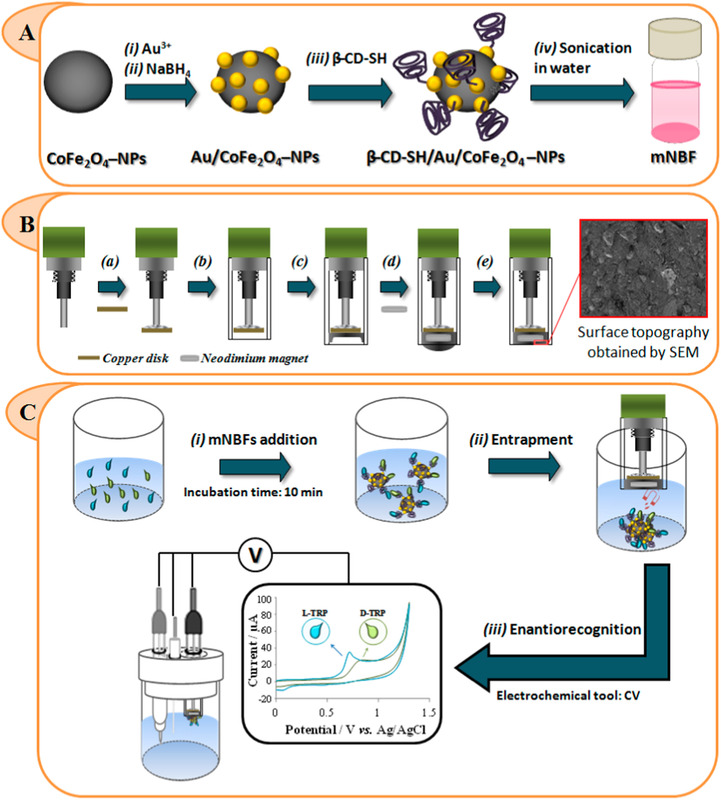 Herein, it is presented a novel, facile and generic methodology focused on exploiting the synergistically and electrocatalytic properties of chiral magnetic-nanobiofluids (mNBFs) with electrochemical enantiobiosensing at a magneto nanocomposite graphene paste electrode (mNC–GPE). The feasibility of this approach has been validated by chirally recognizing tryptophan (TRP) enantiomers as a proof-of-concept. For this aim, a specific chiral mNBF based on an aqueous dispersion of cobalt ferrite loaded with gold nanoparticles carrying a thiolated β-cyclodextrin (β–CD-SH/Au/CoFe2O4–NPs) has been synthesized and used towards the supramolecular discrimination of TRP enantiomers at an advanced graphene-paste transducer via cyclic voltammetry. This strategy, which is the first demonstration of applicability of chiral mNBFs for electrochemical enantiorecognition, opens up new approaches into enantio(bio)sensing. Congratulations to Dr. Antonio Campos, new ICMAB graduate! The PhD Researcher Antonio Campos from the the NANOMOL group will defend his PhD thesis on Thursday, 11 October 2018, at 11 am at ICMAB.